Mihai Alisie, who created Bitcoin Magazine alongside with Vitalik Buterin and was also on the founding team of Ethereum, has announced the launch of a new social network at Ashaka – powered by Ethereum world computer and the Inter-Planetary File System. 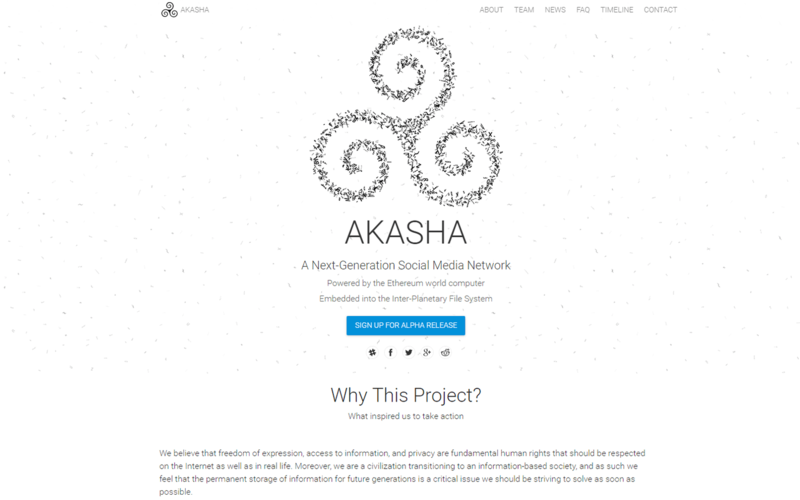 We began developing the AKASHA prototype back in 2015 using Meteor and it was quite an interesting (and at times frustrating) journey; there are no “right” or “wrong” ways of doing things since we are navigating in deep uncharted territories. This is how, by the end of 2015, we started to understand that Meteor is great for many things but not for what we needed, especially as it started to undergo fundamental architectural changes. It was almost like trying to build a card castle on top of moving sands. However, the prototyping stage offered us invaluable insights into what to do and what not to do in some regards while also giving us a general idea on how we should approach the development of the “real” application. After a few weeks of intense research we found a satisfying stack for building a minimum viable product (MVP). Besides Ethereum and IPFS, our tech stack is composed of Electron, React with Redux and Node.js. Along the way we also began to better understand the possibilities opened by AKASHA. More than a social media platform, we’re basically building the social fabric for the nascent etherweb. From collaborative journalism to social crowdfunding, from reusable annotations to social wikis, we see a fractal of opportunities opening in front of us. It is very challenging to stay focused when so many “shiny things” tend to mesmerize your mind but we took a decision to start with blogging as the building block for what’s to follow. And so we began working on a decentralized social blogging network as our MVP, with the goal of creating in the process a product that will empower people from around the world with unfettered freedom of expression. We can do things better now, and we will. Humanity needs a better home of Mind. They are now approaching the alpha stage and they need users and developers to participate in the release. It is our hope that years from now, we will look back at today — May 3rd, 2016 — as the day on which the idea that freedom of expression can be a default standard on the web took root on the Internet. We deserve a better web, and we now have the tools to create it. Step by step, service by service, and application by application we can build something truly world-changing. It will not be easy, but we can do it, together. Join us in this odyssey into the ether.